State Game Commission (SGC) Lands include Wildlife Management Areas and other properties owned, managed, or controlled by the New Mexico State Game Commission. SGC Lands are managed by the New Mexico Department of Game and Fish for the benefit of fish, wildlife, and their habitats. New Mexico’s SGC Lands also provide public access for hunting, fishing, and wildlife-associated recreation. Properly-licensed hunters and anglers can access designated SGC Lands for hunting and fishing. Special access restrictions, license and validation requirements, and rules apply for those hunting and fishing on SGC Lands; see the Rules & Info tab above. Visit the Publications page for current hunting and fishing rules and information. Individuals who enjoy wildlife-associated recreation, other than hunting or fishing, can access designated SGC Lands through the Gaining Access Into Nature (GAIN) program. Potential GAIN activities available on SGC Lands include: wildlife viewing, photography, hiking, bicycling, cross-country skiing, snowshoeing, and horseback riding. GAIN activities are implemented in a manner that avoids impacting licensed hunting and fishing activities on SGC Lands. Special access restrictions, license and validation requirements, and rules apply to those recreating on SGC Lands; see the Rules & Info tab above. Fish hatchery access is governed separately from other SGC Lands. Fish hatchery rules and access information can be found by visiting the Fish Hatcheries page. Special access restrictions, license and validation requirements, and rules have been set to protect wildlife, fish, and their habitats along with public safety on SGC Lands. Please thoroughly read, understand, and follow all of the rules and information below. For questions or more information about SGC Land access, rules, and information, please contact (888) 248-6866 or ispa@state.nm.us. Specific SGC Lands have been designated for hunting, fishing, and/or GAIN access. Lands not designated for access are closed. All SGC Lands are not open to all activities. Please see the tabs above for a table by region of SGC Lands designated for access and the activities for which each is open. 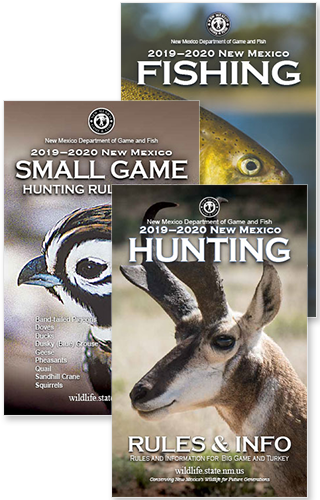 • To Access SGC Lands Designated for Hunting or Fishing: Each hunter or angler must possess a Habitat Management and Access Validation (HMAV) and the proper license valid during dates published for the respective SGC Land in the New Mexico Hunting and Fishing Rules and Information. Each properly-licensed hunter or angler may be accompanied by up to three (3) guests. • To Access SGC Lands Designated for Wildlife-Associated Recreation/GAIN Activities: A group of up to four (4) adults must possess at least one (1) hunting license, fishing license, trapping license, or Habitat Management and Access Validation (HMAV), valid for the current license year. Youth under the age of 18 are exempt from license and validation requirements. You may purchase a license or validation (HMAV) from any Department office, license vendor, by phone at 888-248-6866, or through the Department’s Online License System. Visit the link below to find rules and information applicable to all SGC lands. In the regional tabs above, click on links in the respective table to see additional rules and information that are unique to a particular SGC Land designated for access. Visitors to SGC Lands must also follow all rules posted on site. Notice: The rules and information for specific SGC Lands are in the process of being updated; please check back often for changes. Contact (888) 248-6866 or ispa@state.nm.us for more information..
Click area name from the quick reference table to view full PDF details.